Start your 10 day free trial by entering your email on the Hive.co homepage. Answer a few questions about your company to set up your account and dive right into the dashboard. There’s a login button in the top right corner of the home page. You can also navigate directly to hive.co/dashboard. To get the most out of your account, connect Hive to the other marketing apps you use, like MailChimp, Shopify, and Eventbrite. You can also upload .CSVs with customer data. If you didn’t connect or upload data on signup, you can click Import Contacts in the left sidebar. 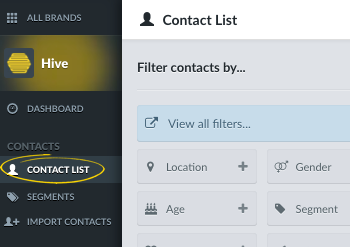 All of the contact and customer data from your connected apps and imported CSVs will be added to your Hive contacts. Hive gives you richer, more complete profiles than your average email tool. Find your contacts by clicking Contact List. Find out more about how Hive enriches and cleans your contact list here: What is a contact profile? Your contact list includes hundreds of filters that helps you build segments to send specific marketing campaigns to. 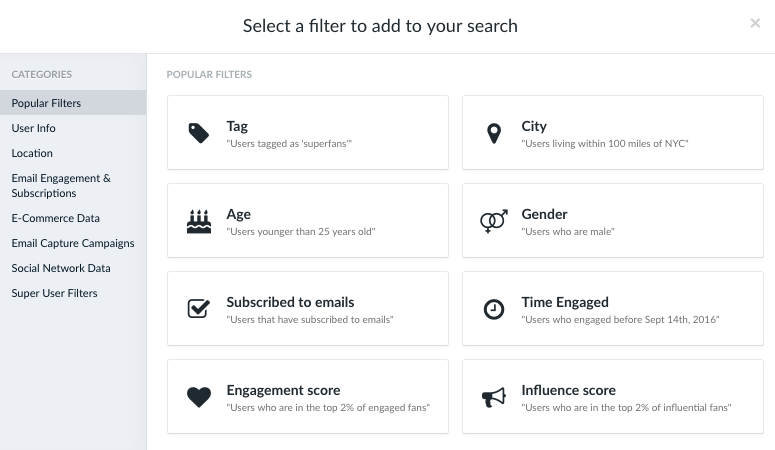 Filter on demographic data, ecommerce data (like amount spent) social network data (who’s engaging with product photos on Instagram), and more. When you create a segment you want to save, create a Static (point-in-time snapshot) or Live (regularly updating) Segment by clicking Create Segment in the top right of your contact list. See What are segments?, How do I create a Live Segment?, and How do I manage my segments? for more information. Hive has a wide range of email marketing tools to help you create campaigns and report on ROI. You can find Email Campaigns, Email Journeys, and Templates in the left sidebar. To set up a custom domain or set your legal mailing address, click Email Campaigns > Email Settings. For more information, see How do I set up a custom email domain? Send a one-time email campaign by clicking Email Campaigns > New Email Campaign > Marketing Email. From here, you can create and send an email to any contact segment, or save the email as a draft or template. For more information on email campaigns, see How do I send an email? Send an automated campaign by clicking Email Journeys > New Email Journey. Hive helps you automate email campaigns based on common actions in your customer journey, like when someone signs up for your mailing list, enters or exits a customer segment, engages with your Instagram page, or enters a contest. For more information on automated email campaigns, see How do I set up an email journey? Find out more about sending emails through Hive here: Sending Email. Hive’s Capture Apps (Contests, Downloads, Signup Forms, and Polls) help you collect contact information from new people who may be interested in your products. You can find all of Hive’s capture apps by clicking All Apps in the left sidebar. You can find helpful FAQs on these tools here: Email Capture Apps. You can add team members as account-wide admins or brand-specific admins. Account wide admins can see all of your brand profiles. To add and manage these members, click the Settings icon in the bottom left corner and then select Edit Organization Details. There’s also a quick add option in the bottom of the left navigation bar (Invite to Hive.co). Brand-specific admins can only see the brand profile(s) you add them to. Click Settings in the bottom left corner > Edit Brand Details. Then choose Manage Brand Admins > + add brand admin to add an admin to your brand. You can manage as many brands as you’d like from one Hive.co account. Create a new Brand Profile by clicking the Settings icon in the bottom left corner > Add New Brand. You can switch between brand profiles by clicking All Brands, also in the top left corner. That's it! If you have questions at any time, email us: hello@hive.co or click the circle messaging icon in the bottom right corner of your dashboard to instant message someone on our team.